I live in a hole. Or, I did. 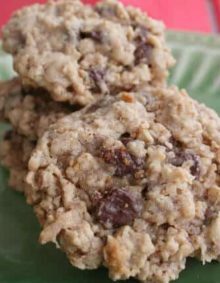 Seriously, there are so many recipes that everyone seems to know about but I am just discovering. Like remember the whole funeral potatoes business? Yup, I had never heard of those before moving to Utah. And other day Rachel from http://asouthernfairytale.com/ introduced me to frito pie. Which I still need someone to just send me a perfect recipe for so I can try it. 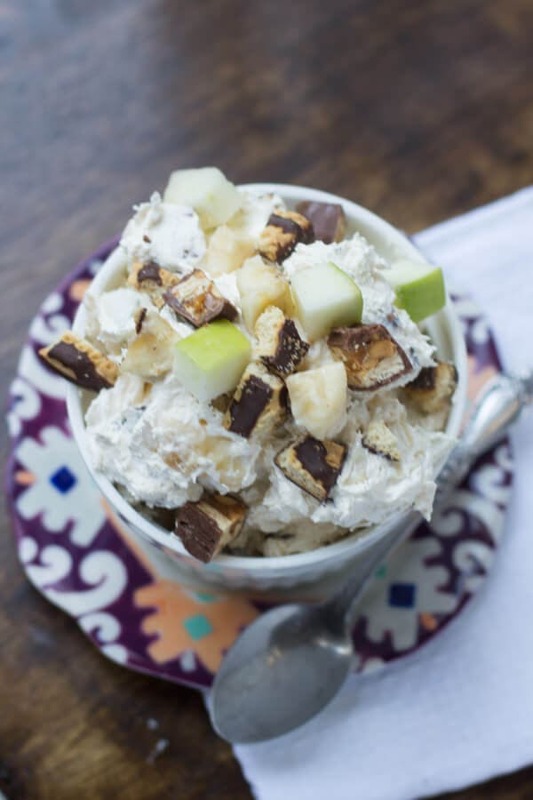 And then there’s snickers salad. SAY WHAT? Yup, it’s a real thing though I’m pretty sure it’s more dessert than salad. 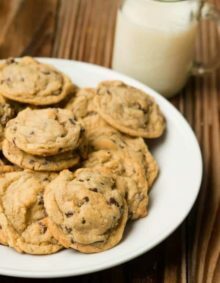 My cute cousin, Amber made it once and while I could of sworn there were also cookies her recipe definitely doesn’t call for it. 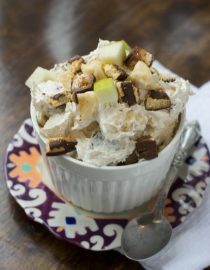 So, I’ll post the real recipe later, but it made me want to experiment with an extreme cheesecake snickers salad version. 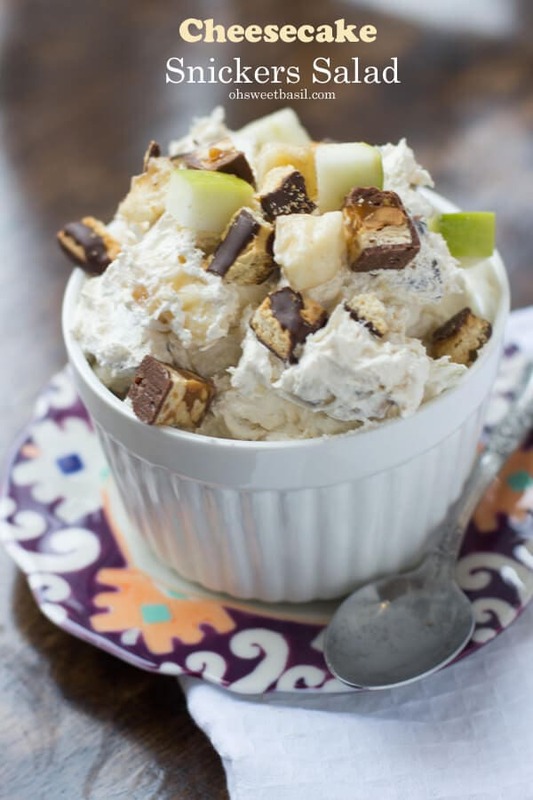 This “snickers salad” really did get a tad out of hand. At first I thought she had those fudge stripes cookies in it for some reason so then even when she told me that there definitely weren’t cookies I couldn’t get it out of my head, so in went the cookies. And then I thought, oh I’ve got that cheesecake pudding in the cabinet that needs to be used, so in went the cheesecake pudding. It’s so creamy! So here’s the superstar list, bananas, apples for crunch, snickers candy bars for caramel chocolatey goodness (seriously, just wait until you get a nugget of candy bar in your bite. It’s delicious.) Keebler Fudge Stripes cookies, whipped cream and cheesecake pudding all stirred into one delicious “salad”. The kids loved it. I loved it. And you all are for sure going to love it. You can not make whipped cream with half and half. Half and half doesn’t have the fat content necessary. What Can You Substitute For Whipped Cream? Mix 1/3 cup softened butter with 3/4 cup milk for a whipping cream substitute. This works as a substitute for heavy whipping cream in recipes. It will not work for whipped cream topping. Does Cheesecake Need to be Baked? 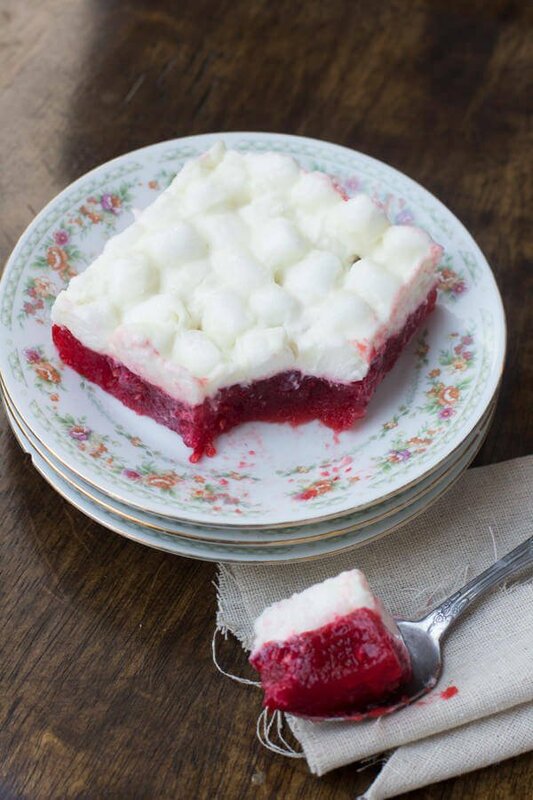 A no-bake cheesecake does not contain eggs and flour, that is why it does not need to be baked. A no-bake cheesecake still has the rich and tangy flavor of cream cheese, and it is still smooth and creamy. Fold together the whipped cream and cheesecake pudding powder until well incorporated. Add the mix ins and fold carefully to not break the bananas. Serve immediately. See note for day ahead prep. Make sure that you just dump the powder into the whipped cream and not actually make the pudding. 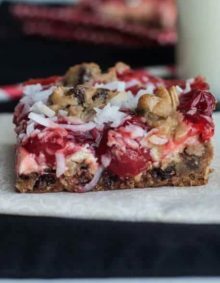 If you’d like to make this salad ahead of time just don’t add the bananas or cookies as they will turn mushy and brown. Add those right before serving. *DROOL* I need this right now, oh goodness does this look amazing!! I love the fun twist with the cheesecake pudding…and I always add those striped cookies too. It makes it so good!!! Pretty sure this is something I couldn’t resist! 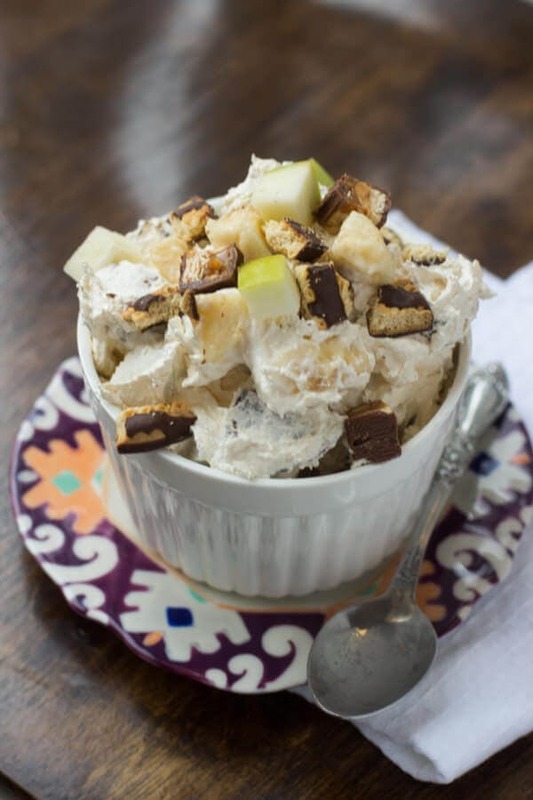 Snickers salad is my husband’s favorite! Love your variation of it! And to think I’d never even heard of it! I must also be behind the loop, because I’ve never heard of snickers salad. When I first saw the name come up in my feedly before the pictures came up I was genuinely confused! Ha! I could seriously get down with some of that. Wowza. right?! It’s totally not a salad in my opinion but I can’t resist the stuff even if it is dessert served with dinner! 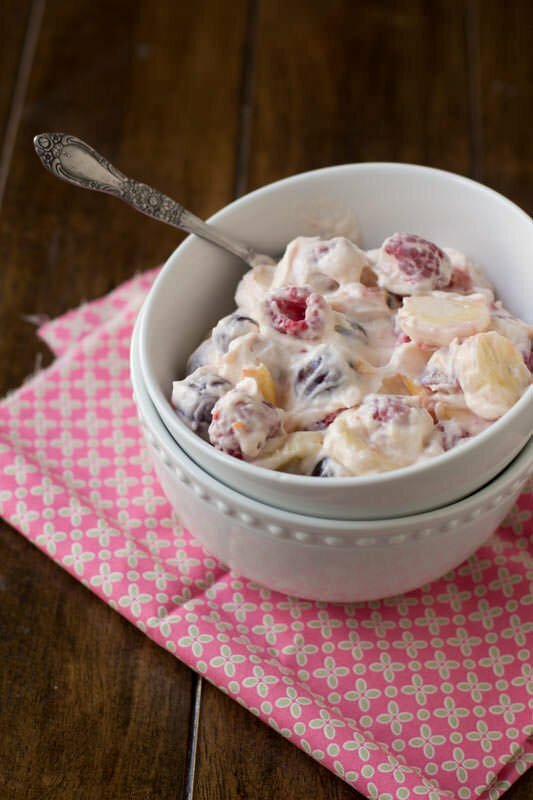 I love ambrosia salads – I’m such a sucker, but they always remind me of my family at the holidays. Love that we both have cheesecake on the brain 😉 And this salad!!! I mean, come on!! I’m not gonna lie – this is making my head explode! This looks fantastically delicious and fun, plus perfect for kids and adults alike. Great recipe! I totally kept digging in for more! You did not just make this?! Cheesecake is MY favorite, and snickers are my husbands favorite desserts! Totally pinning this and making it for us everyday forever. Possibly, even for dinner. And lunch. Let’s go crazy and also throw breakfast in the mix. Yum! lol!! I want weekly reports then!